The Gray Iron Fitness Newsletter, Issue #182. Steve Reeves' old gym. Through the miracle of Internet technology, my website service provider, SBI, can tell me what key words people most often type into their search engine boxes and arrive at Senior Exercise Central.com. When they type in someone's name, it is for information about Steve Reeves, more often than anyone else. Following close behind him are John Grimek and Jack LaLanne. Reeves passed away 16 years ago, in 2000; Grimek died in 1988, and LaLanne in 2011. What these men had in common is that they are icons of the strength, bodybuilding and fitness world of the pre-steroid era. Though each man was an advocate of weight training and represented a pinnacle of achievement, they did not march in lockstep. Each had his own approach to training, which I look at as evidence once again that no single method is perfect for every person. Getting back to Reeves, specifically: Although he’s been gone for more than a decade, people still write to ask how he trained to develop what many observers regard the most symmetrical physique ever seen. And no question about it, he possessed an ideal combination of genes along with the desire and dedication to make the most of what he had been given. In his book, Building the Classic Physique the Natural Way, he credits Ed Yarick as a true friend and his mentor. When I was a kid, living in a semi-rural town east of Oakland, California, I joined Yarick’s gym, based a great deal on stories about Reeves training there. However, by the time I arrived he had won the Mr. America and Mr. Universe titles and had gone on to Southern California for opportunities on the stage and in movies. A few of his training techniques may need to be tweaked a bit, based on current knowledge, but, overall, he was right on target. The methods he used as spelled out in his book are an antidote to much of the steroid-fueled nonsense found in most of today’s muscle magazines. Some find it curious that Reeves left the world of stage and screen when he was a top box-office star internationally. But of an independent mind, he retired to married life on his small Southern California ranch where he raised Morgan horses. 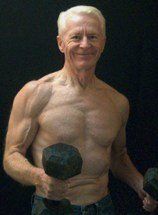 He continued training in his home gym up to the end of his life. He also kept in shape with his method of Power Walking, and wrote a book about it. As he grew older, he was smart enough to scale down his workouts and not injure himself. Instead of the heavy free weights he used in his younger years, he worked primarily with a Universal brand multi-station exercise machine and various cable arrangements that he tailored to fit his needs. From what I’ve heard, he remained strong right up to end of his life. George Helmer was a friend and business partner of Reeves and heads the Steve Reeves International Society. In the following video, Helmer explains how Reeve’s used the Universal equipment to train in his home gym. I think any fan of Reeves will enjoy it. Please take a look here. It’s wonderful. P.S. If you are developing a home gym of your own and want to include a multi-station exercise apparatus, make sure it is a substantial one. You can find cheap imitations at most sporting goods and department stores. But they won’t hold up. My advice is to bite the bullet and buy a good one, or don’t get one at all. Last edition, I wrote about “The Cross Training Advantage.” Someone asked if cross training is the same as CrossFit, the highly popular workouts that have spread internationally. There are some similarities in concept. But I have to say that I’ve never been in a CrossFit gym (or “box,” as they refer to their training spaces). So I’m certainly no expert on their methods. The similarities between the generic term “cross training” and the specific CrossFit system have to do with the workout concept of not repeating the same list of exercises day-after-day, month-after-month; but instead using workout variety training to reach strength and fitness goals.